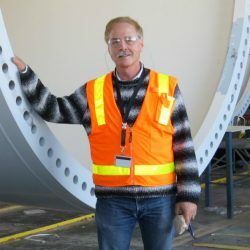 For Vestas’ wind tower manufacturing facility in Pueblo, Colorado, fabrication, welding and assembling a 90 meter, 240-ton steel tower is a breeze. In fact, with its highly trained workforce the southern Colorado facility builds more towers than any other facility in the world. Vestas Wind Energy opened the doors of its 13 million square-foot North American manufacturing base in Colorado in 2010, just as the United States’ wind energy market was gaining considerable momentum. Vestas Towers chose Pueblo for its manufacturing campus because of the region’s workforce, access to higher education and its centralized location to the market. The state’s extensive infrastructure and incredible quality of life, as well as Pueblo’s commitment to expanding talent recruitment and workforce training efforts for the next generation of workers, were also significant draws to the region. Today, the Pueblo facility is the largest tower factory in the world. They are still growing with plans to expand employment in the near future. In recent years, Vestas has also expanded its presence across the state with two turbine blade manufacturing operations now based in Brighton and Windsor, as well as a nacelle manufacturing plant in Brighton. Across the four Colorado facilities, there are approximately 4,000 employees at work in various roles from engineering and welding to inspection supervisors and data & systems specialists. Across Colorado’s central plains and eastern prairie, nearly 2,000 wind turbines dot the landscape contributing to the 14 percent of electricity that comes from wind energy, one of the highest in the nation. That percentage is expected to increase thanks to Xcel Energy and Vestas’ recently announced partnership to build the largest wind farm in Colorado, adding 300 wind turbines that are expected to produce 600 additional megawatts of electricity. The Golden Gate Bridge could be built twice with the amount of steel Vestas Towers uses each year.